Organized by HKNGCA Innovation & Entrepreneurship Centre and HKU is one of the co-organizers. 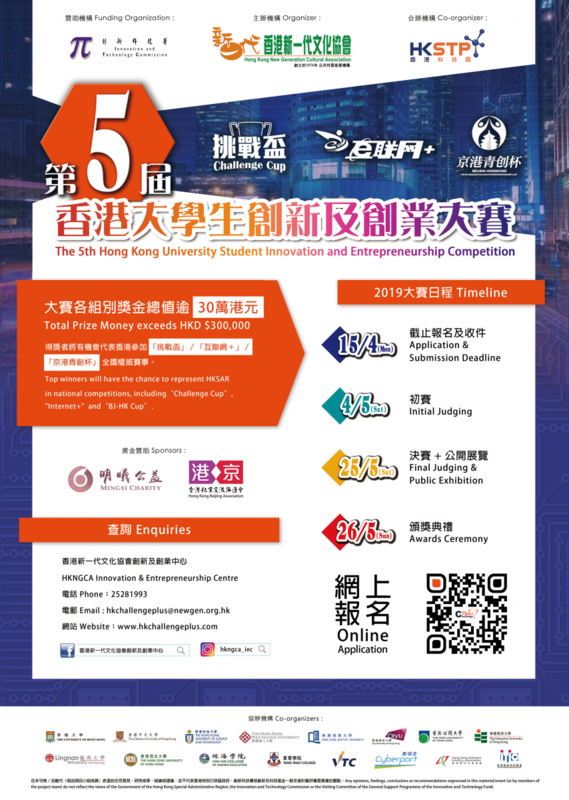 Top winners will represent HKSAR and HKU in “Challenge Cup” National College Students’ Extracurricular Academic Science and Technology Contest (Beijing) 「挑戰盃」全國大學生課外學術科技作品競賽; China College Students’ “Internet+” Innovation and Entrepreneurship Competition (Hangzhou) 中國互聯網＋大學生創新創業大賽. Interested students please apply before 12:00 noon, 15 April 2019 (Monday). If you still do not have any idea to start with or do not have any partner, try the online Startup Matcher platform set up by HKU iDendron to find your team member, project co-founder and interesting ideas.